The March issue of Circuit Cellar magazine is out next week!. We’ve rounded up an outstanding selection of in-depth embedded electronics articles just for you, and rustled them all into our 84-page magazine. Wearable devices put extreme demands on the embedded electronics that make them work—and power is front and center among those demands. Devices spanning across the consumer, fitness and medical markets all need an advanced power source and power management technologies to perform as expected. 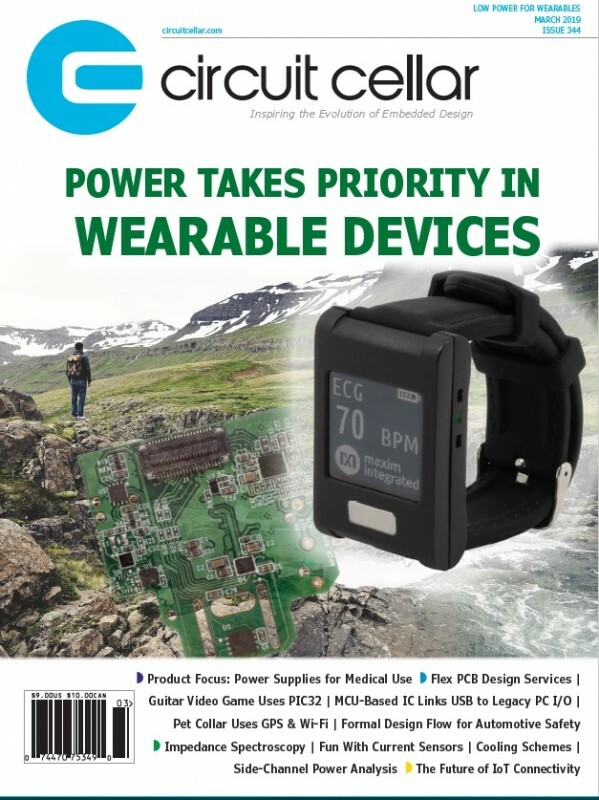 Circuit Cellar Chief Editor Jeff Child examines how today’s microcontroller and power electronics are enabling today’s wearable products. Over the past year, there’s been an increasing trend toward new products that have some sort of application or industry focus. That means supplies that include either certifications, special performance specs or tailored packaging intended for a specific application area such as medical. 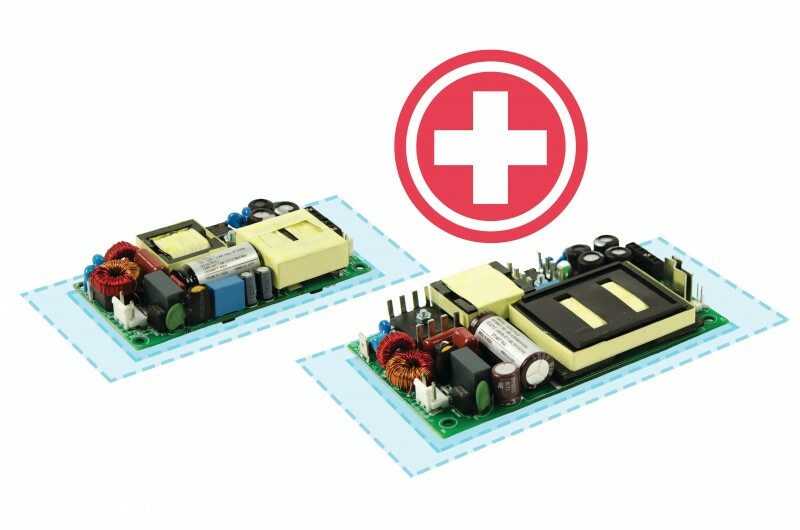 This Product Focus section updates readers on these technology trends and provides a product gallery of representative medical-focused power supplies. While not exactly a brand-new technology, flexible printed circuit boards are a critical part of many of today’s challenging embedded system applications from wearable devices to mobile healthcare electronics. Circuit Cellar’s Editor-in-Chief, Jeff Child, explores the Flex PCB design capabilities available today and whose providing them. Fault analysis has been around for years, and many methods have been created to optimize evaluation of hundreds of concurrent faults in specialized simulators. However, there are many challenges in running a fault campaign. Mentor’s Doug Smith presents an improved formal verification flow that reduces the number of faults while simultaneously providing much higher quality of results. Any good embedded system engineer knows that heat is the enemy of reliability. As new systems cram more functionality at higher speeds into ever smaller packages, it’s no wonder an increasing amount of engineering mindshare is focusing on cooling electronic systems. In this article, George Novacek reviews some of the essential math and science around cooling and looks are several cooling technologies—from cold pates to heat pipes. In PCs, serial interfaces have now been just about completely replaced by USB. But many of those interfaces are still used in control and monitoring embedded systems. In this project article, Hossam Abdelbaki describes his ATSTAMP design. ATSTAMP is an MCS-51 (8051) compatible microcontroller chip that can be connected to the USB port of any PC via any USB-to-serial bridge currently available in the market. The PIC32 has proven effective for a myriad of applications, so why not a dog collar? Learn how Cornell graduates Vidya Ramesh and Vaidehi Garg built a GPS-enabled pet collar prototype. The article discusses the hardware peripherals used in the project, the setup, and the software. It also describes the motivation behind the project, and possibilities to expand the project in the future. While music-playing video games are fun, their user interfaces tend leave a lot to be desired. Learn how Cornell students Jake Podell and Jonah Wexler designed and built a musical video game that’s interfaced with using a custom-built wireless guitar controller. The game is run on a Microchip PIC32 MCU and uses a TFT LCD display to show notes that move across the screen towards a strum region. Impedance spectroscopy is the measurement of a device’s impedance (or resistance) over a range of frequencies. Brian Millier has designed many voltammographs and conductivity meters over the years. But he recently came across the Analog Devices AD5933 chip made by which performs most all the functions needed to do impedance spectroscopy. In this article, explores the technology, circuit design and software that serve these efforts. Side-channel power analysis is a method of breaking security on embedded systems, and something Colin O’Flynn has covered extensively in his column. This time Colin shows how you can prove some of the fundamental assumptions that underpin side-channel power analysis. He uses the open-source ChipWhisperer project with Jupyter notebooks for easy interactive evaluation. Your choice of power supply can have a major impact on your embedded system’s capabilities. 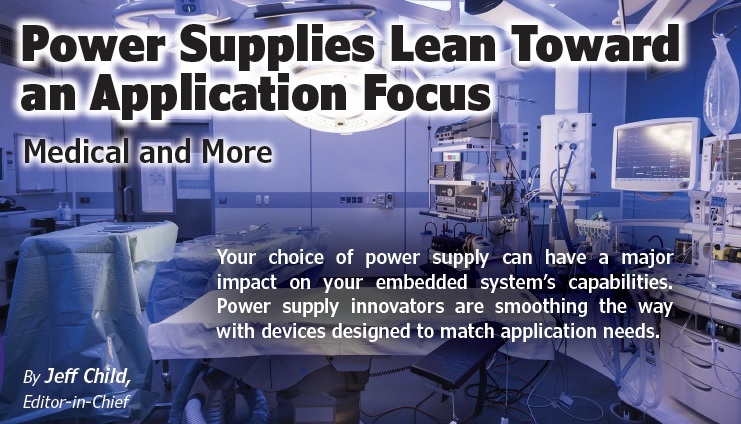 Power supply innovators are smoothing the way with devices designed to match application needs. Arguably the unsung heroes of any embedded system design, power supplies and converters are critical enablers for meeting today’s needs. As embedded systems pack ever more intelligence into smaller spaces, power has direct implications on the size, cooling and mobility of any system. To keep pace, power supply vendors continue to roll out more efficient products, new partitioning strategies and more compact solutions. In tandem to those trends, there’s a growing demand to reduce size, weight and power of system electronics. Driving those demands is a desire to fit more functionality in the same space or into a smaller footprint. If you look at the power supply products released over the last 12 months, there’s been a definite uptick in new products that have some sort of application or industry focus. While this hasn’t diminished the role of general purpose power supplies, the trend has been toward supplies that include either certifications, special performance specs or tailored packaging intended for a specific application area such as medical, industrial, railway or the IoT. An example along those lines in the medical space is the TDK-Lambda brand CUS150M series of AC-DC 150 W rated power supplies announced early this year by TDK (Figure 1). The device has the capability of operating in ambient temperatures of up to 85°C without the need for forced air cooling. Certified to medical and ITE standards for Class I and II (no earth ground connection) operation, the product meets both curve B radiated and conducted emissions. CUS150M target applications include medical, home healthcare, dental, test and measurement, broadcast and industrial equipment. The CUS150M series of AC-DC 150 W rated power supplies are certified to medical and ITE standards for Class I and II operation. It meets both curve B radiated and conducted emissions. Output voltage options include 12 V, 15 V, 18 V, 24 V, 28 V and 36 V models. The CUS150M operates from an 85 VAC to 264 VAC input and has operating efficiencies up to 91%. Off-load power consumption is less than 0.5 W and a 10 V to 12 V, 0.5 A fan supply is fitted as standard. 50 W at 80°C. Cover or top fan options are also available. Input to output isolation is 4 kVAC (2xMoPP (Means of Patient Protection)), input to ground 1.5 kVAC (1xMoPP) and output to ground 1.5 kVAC (1xMoPP) making the series suitable for B and BF rated medical equipment. Touch current is a maximum of 100 µA, with leakage current less than 250 µA. 5,000 m is the maximum operating, transportation and storage altitude. 26.4 VDC. The I/O isolation is specified for 4,000 VAC with reinforced insulation and rated for a 300 VRMS working voltage. safety approvals under the 2xMoPP requirements. 180 W up to 550 W, to its line of internal AC-DC medical power supplies (Figure 2). Certified to the medical 60601-1 edition 3.1 safety standards for 2xMoPP applications and 4th edition EMC requirements, the VMS-180, VMS-225, VMS-275, VMS-350 and VMS-550 series feature high efficiency up to 94% and high-power densities up to 30 W/in3. The devices are housed in 2″ x 4″ (50 mm x 101 mm) and 3″ x 5″ (76 mm x 127 mm) packages with profiles measuring as low as 0.75″ (19 mm), providing a compact, high density solution fokproviding a compact, high density solution for medical diagnostic equipment, medical monitoring devices and dental applications. The VMS-180, VMS-225, VMS-275, VMS-350 and VMS-550 series power supplies are certified to the medical 60601-1 edition 3.1 safety standards for 2xMoPP applications and 4th edition EMC requirements. 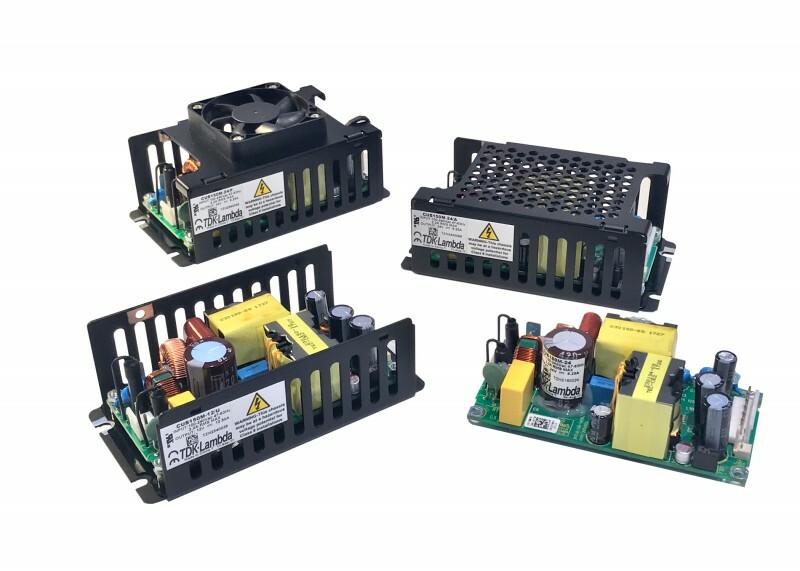 All of these VMS series supplies provide output voltage options from 12 VDC to 58 VDC, feature wide universal input voltage ranges from 80 VAC to 264 VAC and offer no-load power consumption as low as 0.5 W. The 180 W to 550 W models also carry an input to output isolation of 4,200 VAC with leakage current ratings as low as 0.3 mA at 230 VAC. Operating temperatures range at full load from -40°C up to +50°C with forced air cooling, derating to 50% load at +70°C.